I've been dying to post about this awesome swap for months now ... and it's finally time to share what Mummy's been Up To for the last 6 months or so. It's a swap that I signed up for back in June, and I received my partner's details soon thereafter so that I could begin creating. 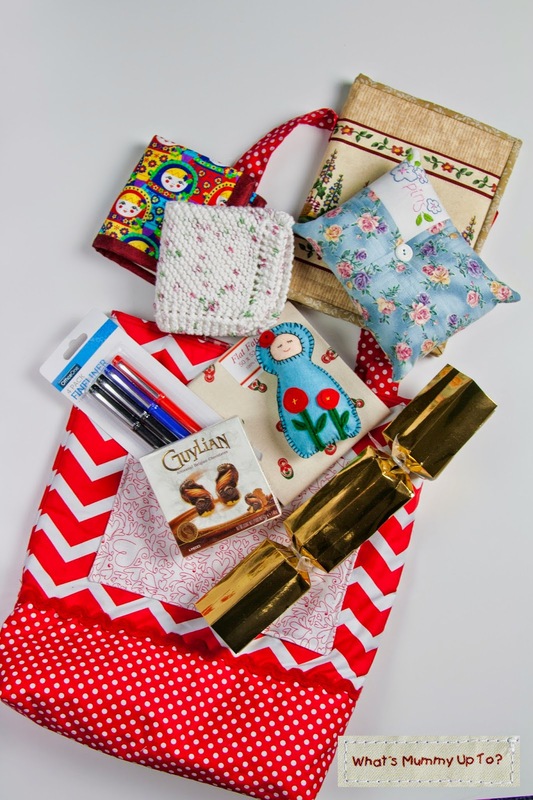 This swap is hosted annually by the lovely Cheryll, with the idea being that each participant creates a Christmas sack or tote with 5 gifts inside, the majority of which are to be home-made. It's a great swap for anyone really, because there is so much time allowed to make the gifts. It was really super-fun! I was partnered with the amazing Tracy, and was encouraged to get to know her a little over the following months in order to come up with ideas about things she might like, ideas about her style / colour preferences and just generally to make a new friend. I have to admit that I didn't make any of my gifts for about the first 3 months or so. I pondered what to make, then changed my mind, had new ideas, and promptly forgot what I had thought of. But Tracy made things easier with her candid blog about her life on a little farm in country NSW. I love hearing about her veggie garden, animals and crafting, and I really feel like I've gotten to know her this year. I'm a little jealous of her rural lifestyle I have to admit. In fact, Tracy reminds me a lot of another friend of mine and many of the things I made came to mind after thinking about things my other friend may like. 1. 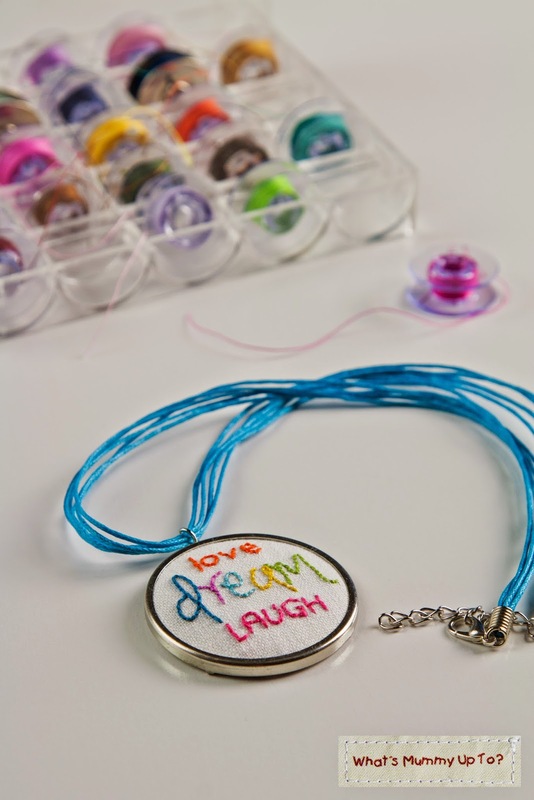 An embroidered "Love, Dream, Laugh" necklace. Back in September, I went along for my first ever Urban Stitches, run by the amazing Rosalie Quinlan, Melly McNeice (Melly & Me) and Jodie Carleton (Ric Rac). I was extremely daunted as I've never done embroidery before, but was encouraged by a lovely group of ladies from my church together with my Mum to give it a go. This necklace was designed by Melly, and came in a kit with a few other designs (two of which I made for my girls on the day), and a gorgeous metal necklace piece which fits the design perfectly. As soon as I saw this I decided I would do this one for Tracy. Such a unique jewellery piece, and so much fun! You might spot this same embroidery design in a few upcoming projects too ... I'm a little addicted to it! 2. 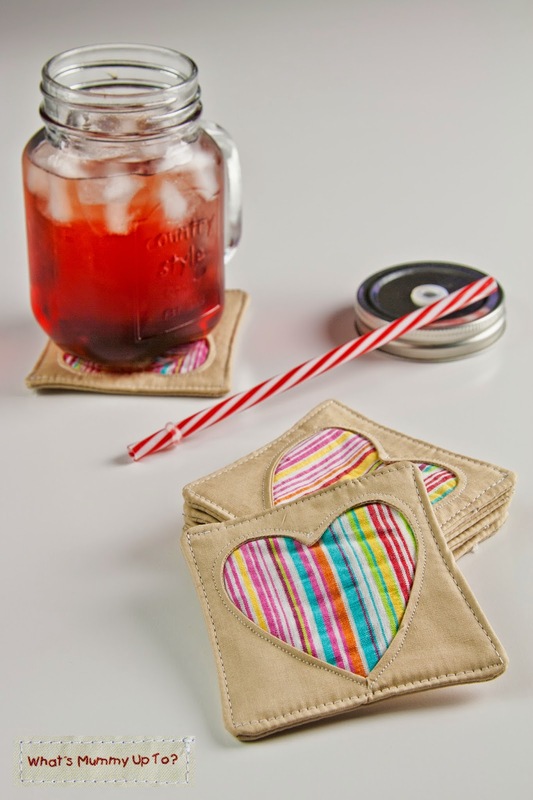 Heart Coasters - This was my first ever attempt at reverse appliqué, and they were so much fun. I followed a tutorial for these coasters here after it popped up on my Facebook feed one day, and I thought they looked interesting. This was a 1-afternoon project, and a really cute little gift idea. I know it's too late for this year, but I think they'd make a fun teacher-gift at Christmas time. 3. 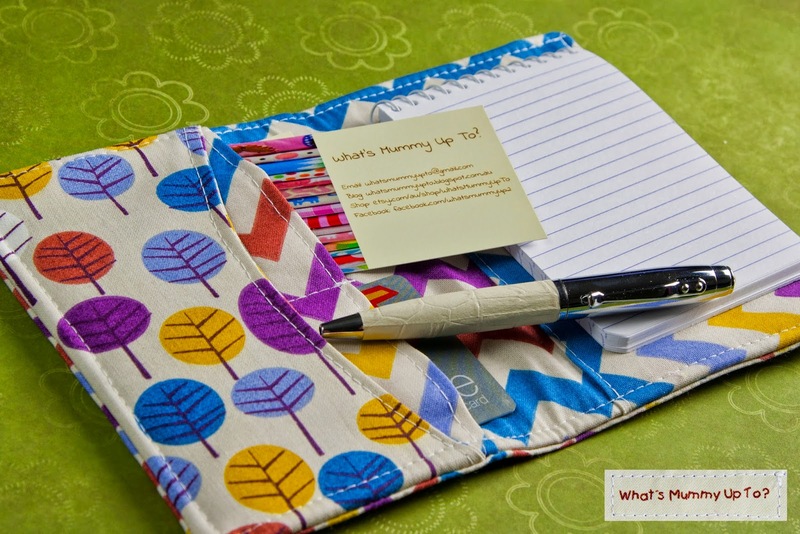 An Organiser Wallet made using this design from LBG Studio. I've made these quite a few times now, and they're always a hit. Great to use up small bits of left over fabrics, and I love it in these cute blue, red and purple tones from this line of fabrics I found a year or so ago at Spotlight. I think they're an organic cotton, and they're great to sew with. 4. 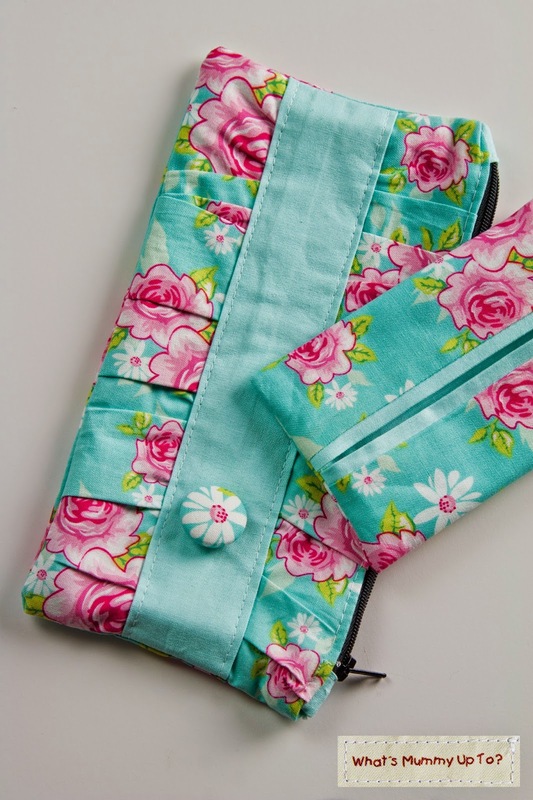 A Gathered Clutch and matching tissue holder. I used the Gathered Clutch tutorial from Noodlehead, which I've also made a few times before and really like how it turns out each time. I used the tutorial here for the tissue cover. I thought this fabric was just lovely, and I bought it from a remnant bin when I was shopping one day. Perfect amount for these little projects. 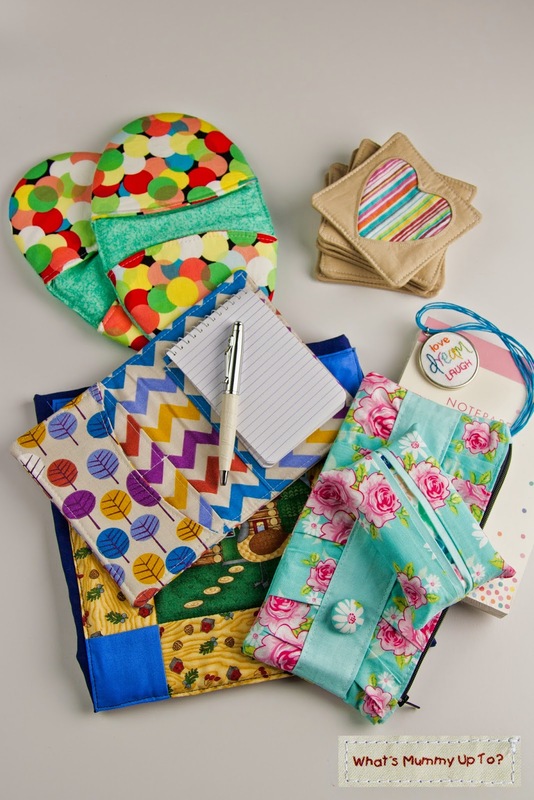 I'm feeling a waste-not-want-not post coming on for projects using remnants or small left-over fabric pieces ... hmmm!! 5. 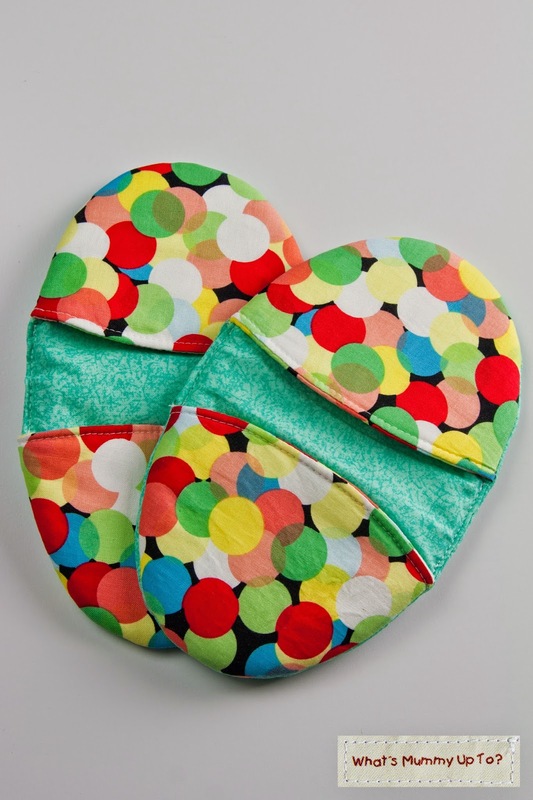 And a pair of these cute little hand-sized oven-mits, which I made using this tutorial. In fact, these were so much fun to make that I ended up making about a dozen of these, and gave them out this Christmas with some homemade biscotti to our families. I love the size of these and once again these are a great way to use up those pieces of designer fabric like this Michael Miller that I just can't bear to part with until it's absolutely all gone ... waste not want not and all that! And for the Sack (I asked Tracy at the beginning of the swap whether she'd like a sack or a tote, and she opted for a sack), I used a cute little Christmassy panel from a piece of fabric my mum had in her stash, quilted them very simply onto some thin wadding and attached to the front of a basic drawstring sack made using navy-blue homespun. (Sorry I didn't get a good pic of the sack ... check out Tracy's post for a better look!) It was similar to how I made these Christmas sacks for my girls, and I was happy with how it turned out. Tracy said that her daughter used it this year for her Christmas sack, so I'm thinking that means it was liked!! Yay for that! 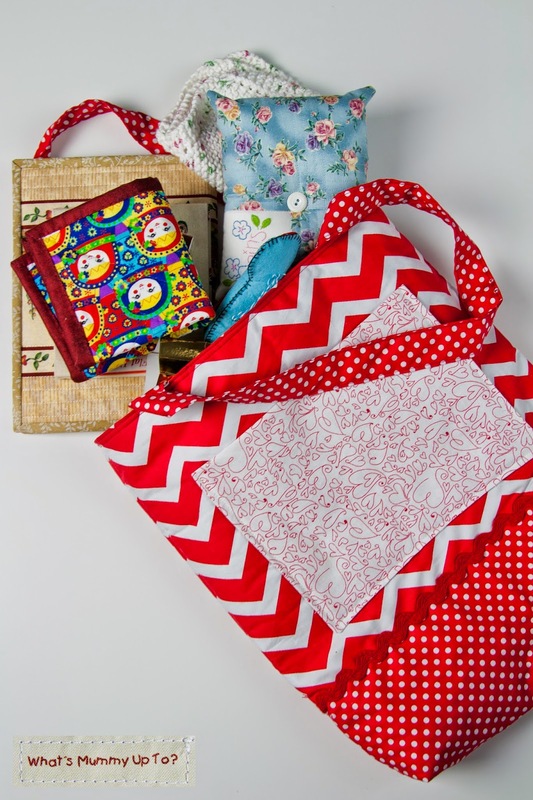 I received this beautiful red chevron and polka dot tote, with a gorgeous stripe of red ric rac around it ... it's like Tracy was inside my head ... chevron, spots and ric rac ... LOVE! I also love the big pocket on the front of this tote, and I can see it being used and used for so many purposes. Thanks Tracy! 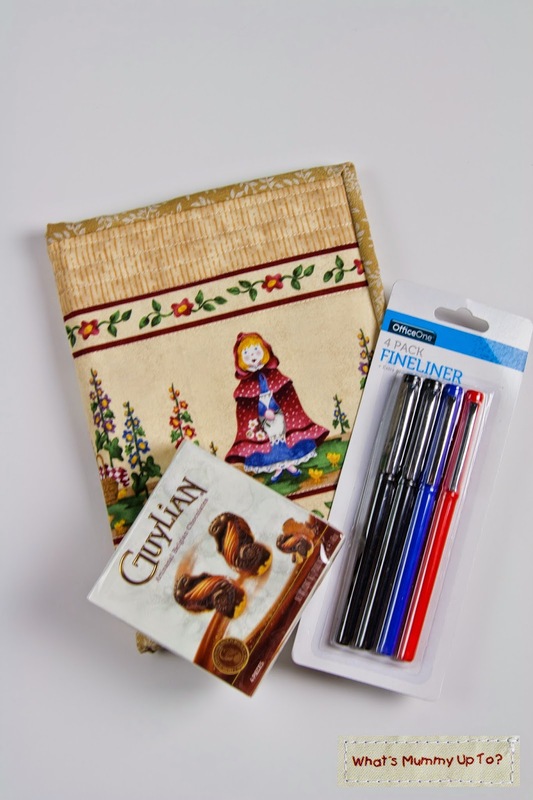 My favourite gift inside this tote was this beautiful fabric-covered notebook. How absolutely adorable is the Red-Riding-Hood fabric. This is a perfect example of what's great about swaps ... The colours in this fabric are not normally ones I would be drawn to if I saw this fabric at a fabric store. But when it's been loving stitched into a book cover like this, I can't think of a better fabric to have used. I love it, and it's so pretty. I will need to hide this one from Bethany who also loves it! 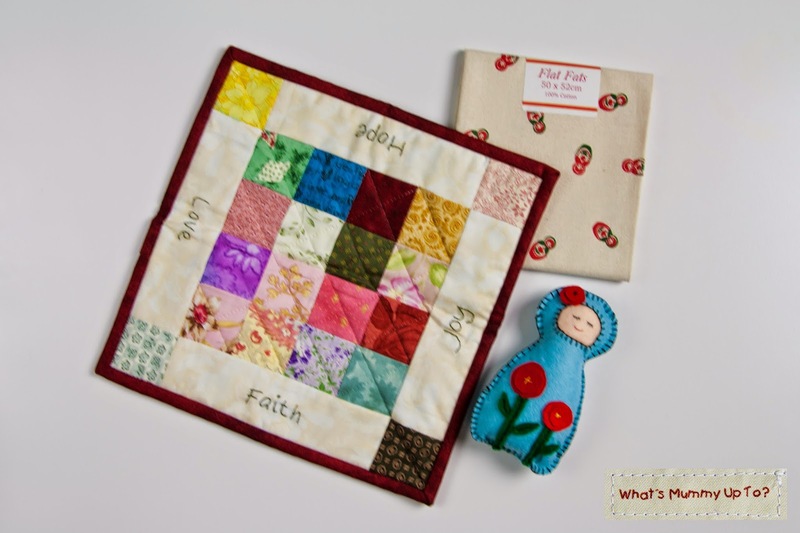 Tracy also sent a lovely patchwork mug-rug, with Babushkas on one side and beautiful embroidered words on the other. She also included this fat quarter of babushka fabric (another of my favourite things ... great job Tracy!) and a cute little babushka hanging ornament, which my girls love. Hannah kindly offered to hand this on her door ... such a good helper, that one!! And last but not least, Tracy gifted me a beautiful hand-knitted dishcloth, which I love ... I have a couple of hand-knitted dishcloths, and I think they are so much better than anything else. This will be well-used. She also made a sweet little pin cushion, with lovely embroidery in the corner. 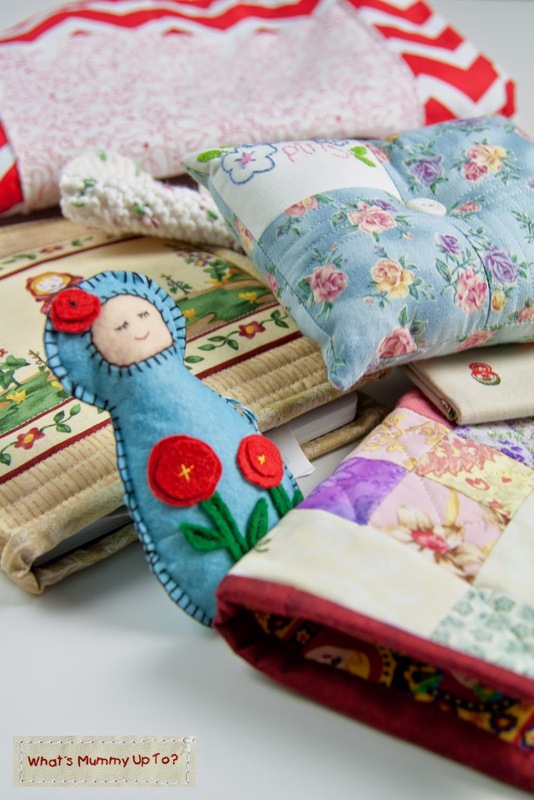 Just perfect as I have been meaning to make an extra pin cushion so I can have one at my machine, and one at my cutting table (aka the dining room table!). This will save me from forever running between the rooms to get my pins! So, all in all I feel extremely spoilt, and would like to say a huge thank you to Tracy for being THE best swap partner. Oh, and a big thanks to Cheryll for hosting this. I've already convinced my Mum that she should also join this swap for 2015, and am so looking forward to being part of it again. 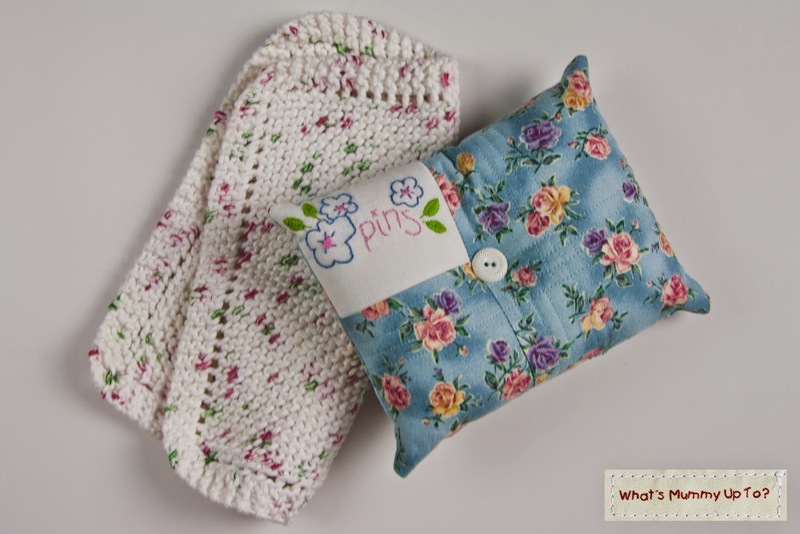 Gorgeous swap items you both made for each other!